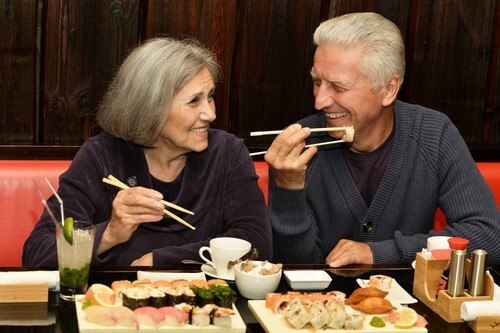 Home » Blog » What Foods are Good (and Bad) for Dentures? Posted November 14, 2016 by Andler Dental & filed under Restorative Dentistry. At my dental office in Madison, we are always teaching patients about the effects different foods and beverages can have on teeth, and the importance of maintaining excellent dental hygiene at home. The same is true for denture patients! It’s important to try and avoid foods and drinks that can literally be a real pain. We’ve put together a list of some of the good foods, (along with the not-so-good) as a reminder. Check it out! Veggie Crisps – They are a great alternative to popcorn if you’re craving something salty. Remember to stay hydrated to maintain proper saliva production to avoid denture slippage. Olives, Grapes, & Berries – Softer snacks are better for dentures. This includes pitted olives, grapes, and seedless berries. The best part is — they’re good for you too! Smoothies – A great way for denture wearers to get their daily dose of fruits and veggies is in the form of a healthy smoothie. You can puree your favorite things into a smooth, delicious treat. Now that we’ve gone over some of the denture-friendly foods you can enjoy, it’s time to take a look at some of things that might be best to avoid. And remember, if you ever have any questions about your dentures and how to properly care for them, give your Madison dentist a call. Nuts – Nuts and dentures tend to not work well together. Little, often painful, pieces of nuts can get stuck under your partials or dentures, making them uncomfortable and unstable. Popcorn and Seeds – While both of these foods can be delicious, tiny bits and pieces can get stuck in dentures and be troublesome. It’s best to opt for an alternative to avoid any issues. My Madison dental office is always ready to answer your questions. Please do not hesitate to give us a call at any time. We’re always happy to help.